Exactly the same as me. I'd suggest a "M" for a good fit (not even snug). "L" will appear a rather baggy, but passable. Hey Rehaan, I'm 5'6" and 75kgs with a waist size of 34". Size 40 "slim fit" shirts are tight over my shoulders but no issues with the belly part! Casual L size shirts are perfect. Last year I had picked up an L size in initial batch which was quite snug fit which I had reported and was told that sizes marked were 1 size down I guess.. Which one should I go for now? Hey Rehaan, I'm 5'6" and 75kgs with a waist size of 34". Size 40 "slim fit" shirts are tight over my shoulders but no issues with the belly part! For Large: 40" (v2) /vs/ 44" (v3). FYI v3 XL chest measurement is 47". Hopefully this should give you a clearer idea? Hmmmm. . Ok. So should I go in for L(V2) again? v2 is last year's (version 2 of the hoodies - which you already have). They are no longer for sale. This year's (v3) hoodies are 3 inches bigger around the chest when comparing last year's L size to this year's L size. If you think that's enough of an increase for you, then L would be the right size for you this year. If you feel like you need even more, then go for XL. Thank you so much Rehaan, for the suggestion. I made the order for a M sized hoodie. Now, hoping to get it before I return to Japan. The hoodie was delivered well within 20days time and is of very good quality. Although I would have preferred L, I went with M and it fits well. Will get an L next time as I like the hoodie to be a bit loose and not hug me. Thanks Rehaan and your team of people who have put so much efforts in getting such wonderful products. OT: It felt so good to see the Made in India tag. 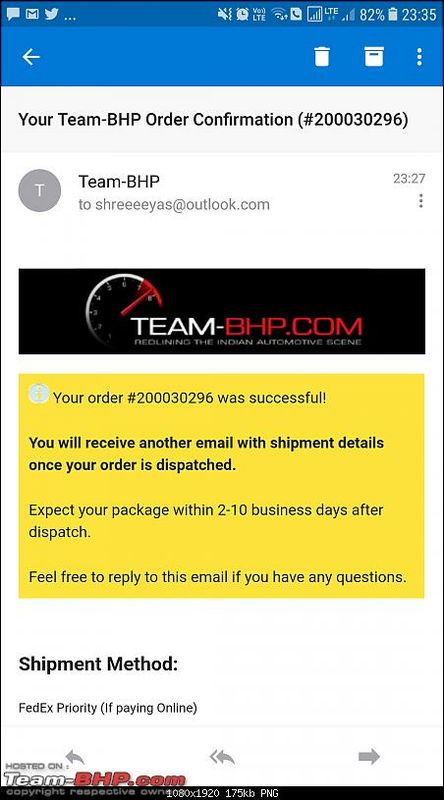 I had ordered 2 team bhp jackets for me and my cousin, one on 18th dec 2017, and the other on 20th dec 2017. 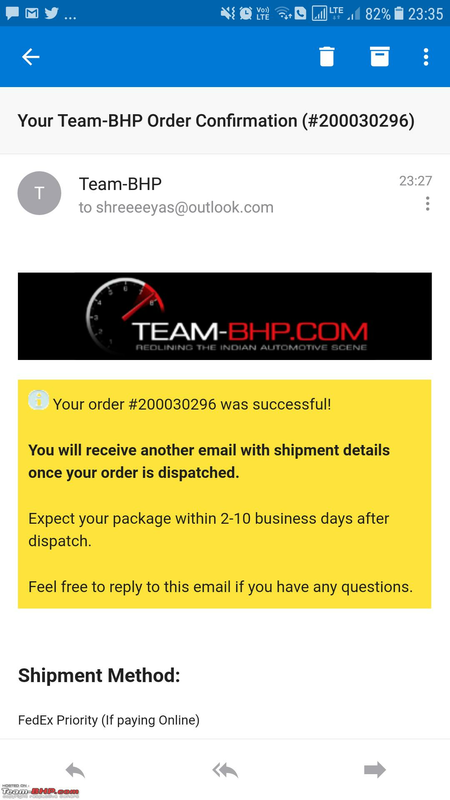 Got a confirmation mail regarding the same, but got no details of shipping till now. I want the jacket for a drive which i am going on 12th jan. Can i get them before 12th jan? I want the jacket for a drive which i am going on 12th jan. Can i get them before 12th jan? We've just received the Hoodies from the printer this morning, and they will be shipping out today. Delivery by the 12th seems very likely (unless there is some issue with FedEx). Came up on this thread very late, are the red ones out of stock for good? We wont be re-stocking any Hoodies / Jackets until next winter. Can hoodies be used instead of leather jackets for short distance riding? I'm basically looking for excuses to get these while living in hot and humid Chennai! Just ordered jacket (Anthracite Grey 2XL). I added personalised text( my handle) but forgot to select print on the back option . I want "live to Drive " print on the back . Please suggest what can be done? I am attaching herewith my order confirmation mail. Reply back to the store order mail and I'm sure Rehaan will help you out. That said - In all seriousness, please don't compromise on safety in any way. I've just sent you an email mentioning something about Hotmail / Outlook addresses - did you receive it? On second thoughts I'm happy with Blue. Cool. Did you mean to not have any personalized text? If you wish to add some, you can do that by replying to your store order email. I have been using the teambhp hoodies extensively in and around Pune all during the Winters. Also had used the same during my road trip to WB and it went per expectations. The only gripe (if I may) is with regards to the stitching and it seems at places to be coming off, specially the interlocking. Its definitely not something I cannot live without and a small retouch would serve the purpose, but I am sure v4 will look into this as well. Overall, me and my wife are happy with our purchases and it served us well. Anything in pipeline for the kids? Looking forward to half jackets with hoodies. In places where winters are comparatively less chilled, half jackets are of great use. All times are GMT +5.5. The time now is 04:28.